Countess Barbara de Brye purchased the Hanzell Vineyards estate in 1975 as a business investment and the family’s vacation retreat. Her son, Alexander, visited the Hanzell estate for the first time at age five months and spent his youthful years exploring every oak tree and vineyard path on the property. At sixteen years of age, he inherited the Hanzell estate, shouldering the care, maintenance and business management of a wine icon that has been revered since its founding in 1953. 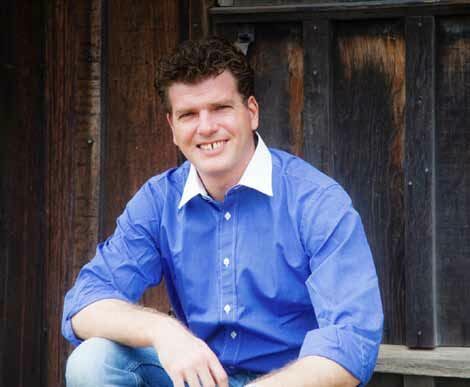 In 1998, Alexander assumed the helm of Hanzell Vineyards, and along with an International Board of Directors and winemaker Bob Sessions, created and implemented a fifteen year plan to sustain and protect the future of Hanzell Vineyards. Alexander developed a design to slowly grow Hanzell to 46 acres of vineyards and slowly increase production from 3,000 to 8,000 cases. Dr. Paul Skinner of Terra Space was hired to direct a vineyard replant to improve under performing vineyard blocks, adding to not only St. George rootstock but other new rootstock selections. The work in the existing vineyards continues today. New vineyards were planted between 1999 and 2008, and a new barrel aging cave and winery building were completed in 2004. 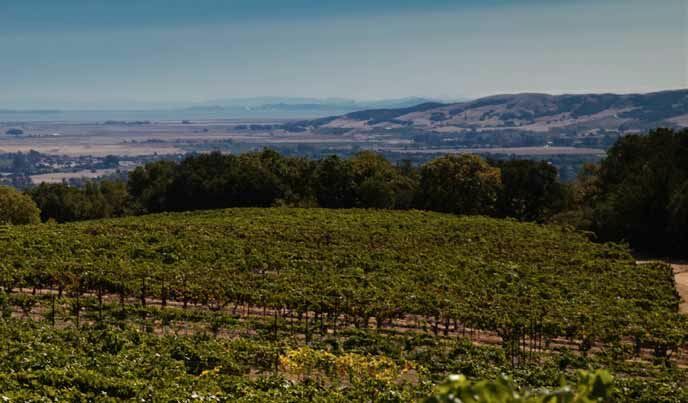 The 16-acre de Brye Vineyard was first planted in 1976 by Bob Sessions and José Ramos Esquivel in a field dotted with grand oaks and an expansive view of San Pablo Bay, Mount Tamalpais and San Francisco. This vineyard, now in its 37th year, could be considered the heart of the estate since it has supplied the power behind Hanzell’s Estate Chardonnay since the mid-1980s. Consisting of 15 acres (13 acres planted originally and two more acres added in 1999), the de Brye Vineyard is located close to the top of the property with a southern exposure and a 10% slope to its terraced vine rows. It is planted with Hanzell clone Chardonnay and Pinot Noir budwood propagated from the Ambassador’s 1953 Vineyard on St. George rootstock. The soils are Red Hill Series clay loam, which is moderately well drained and underlain with a mix of basaltic rock, and typically found on ridgetops and mountainous uplands. 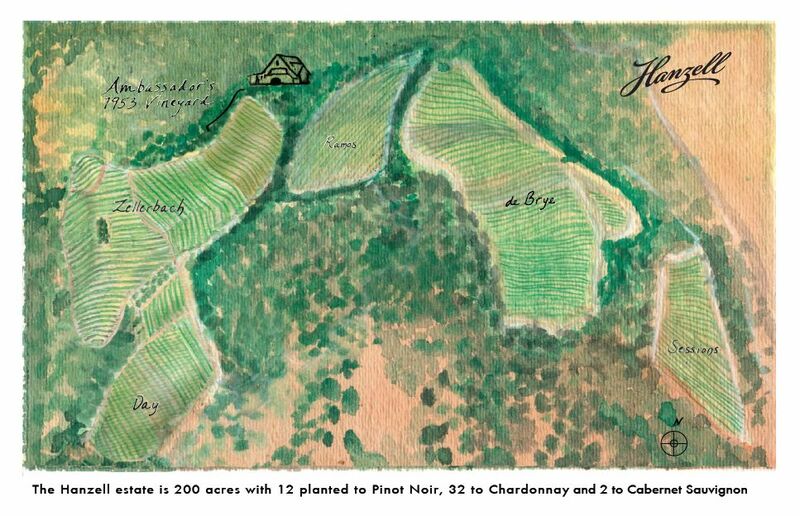 A photo of the de Brye Vineyard and a schematic of the Hanzell vineyards is included below. The de Brye legacy has expanded with the introduction of the first single vineyard selection bottling from the de Brye Vineyard, the second release as part of a series of new Estate Single Vineyard wines introduced for the first time this year. The first wine, the Sessions Vineyard Pinot Noir, was introduced in March 2013 and was discussed and reviewed in the PinotFile, Volume 9, Issue 17 at www.princeofpinot.com/article/1390/. 2011 was a challenging vintage in the Sonoma Valley. Rain and cold weather during bloom caused a considerable amount of shatter (millerandage). 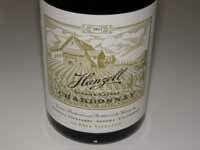 Chardonnay yields were down on the Hanzell estate by 40% with some blocks down as much as 50%. Because of the extra ground moisture from the rain coupled with the low crop load, the vines produced additional shoots and leaves requiring extra suckering, leaf pulling and hedging passes to keep the canopy in balance with the light crop. Harvest began on September 20 after one of the coolest growing seasons on record. According to winemaker Michael McNeill, traditional Hanzell practices of limited skin contact, carefully controlled fermentations, and a moderate use of new French oak were employed. Through a rigorous evaluation of barrel lots and then the blending process, only six barrels of de Brye Chardonnay were selected to be bottled as the inaugural de Brye Vineyard Chardonnay. 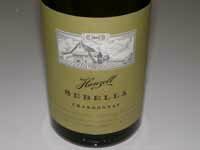 Despite the vintage vagaries, McNeill said, “The de Brye Chardonnay expresses the qualities and age-worthy style of this unique estate.” The Hanzell Estate Chardonnay also underwent a rigorous evaluation and blending process such that only select barrels were included in the final blend. The 2012 vintage offered an ideal spring with warm sunny days interspersed with well-timed rains. Set resulted in dense, full clusters. The summer was noteworthy in that it lacked the typical heat waves. Still, several thinning passes were required to maintain the balanced low yields that are preferred. Harvest began for the Hanzell “Sebella” Chardonnay on August 27 in the Zellerback Vineyard with the Robert Young and Old Wente clones, and concluded on September 11 with the Hanzell clone from the Ramos Vineyard. Hanzell wines are available for purchase by guests visiting the new Hanzell Vineyard’s website at www.hanzell.com. The Collector Program guarantees an allocation of Hanzell Vineyards Estate Pinot Noir and Chardonnay and the Ambassador’s Circle Exclusive and Private Collector levels provide access to the Ambassador’s 1953 Vineyard releases, the Hanzell wine library annual offering and the holiday magnum offering. Future Estate Single Vineyard wines include a 2011 Ambassador’s 1953 Vineyard Chardonnay and single vineyard wines from Ramos Vineyard and Day Vineyard. Visitors are received by appointment only. Two levels of visits are offered, both of which include a guided vineyard tour and seated tastings. The winery should be on every pinotphile’s bucket list of iconic wineries to visit.